The Central Mass Striders men's team won the New England Trail Championship in Exeter, NH. The race featured almost 10 miles of single track trail featuring planks, boardwalks, and tunnels. When the dust settled, Tim Van Orden would finish 2nd overall and top master runner. Scott Mindel was close behind for 3rd overall. Todd Callaghan was the 2nd master runner of the day with a 5th place finish. Scott Leslie would finish 9th, James Pawlicki 10th, Ed Sheldon 22nd, and Paul Bazanchuk would finish 2nd in his age group. 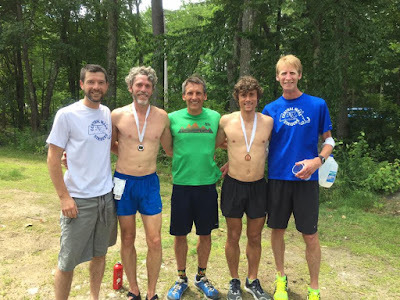 The Central Mass Strider men’s racing team took five 1st place team medals in two races over the weekend within the Granite State: Mount Washington Road Race and the Ribfest 5 mile, USATF New England 5 Mile Championship. On Saturday, all three CMS men’s teams (open, masters, seniors) placed 1st in the Mount Washington Road Race which is 7.6 miles from the base to the summit via the auto road. Dave Dunham would lead the charge and score on all three teams for CMS. On Sunday’s Ribfest 5 mile New England Championship road race Merrimack, NH – the masters and senior teams placed 1st. Ed Sheldon would lead those teams after running the Mount Washington Road Race the day before. The men’s open team placed 3rd on the muggy Father’s Day. Scott Mindel led the open team with a 9th place finish and a time of 25:36. Nate Jenkins, Scott Leslie, Ben Fazio, and Pat Fullerton would round out the scoring.